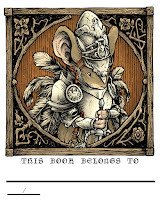 For this year's Mouse Guard bookplate (For new fans, I've done an annual limited-edition bookplate since 2012...links at the bottom of this post to see process on them all) I decided to once again ape the design of a character from Jeremy Bastian's Legends of the Guard story: Faulknir. 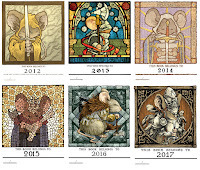 To the left you can see the 2017 bookplate, which will be available at my convention appearances as well as in my online store, and for this week's blogpost, I'll share the process for creating the image. 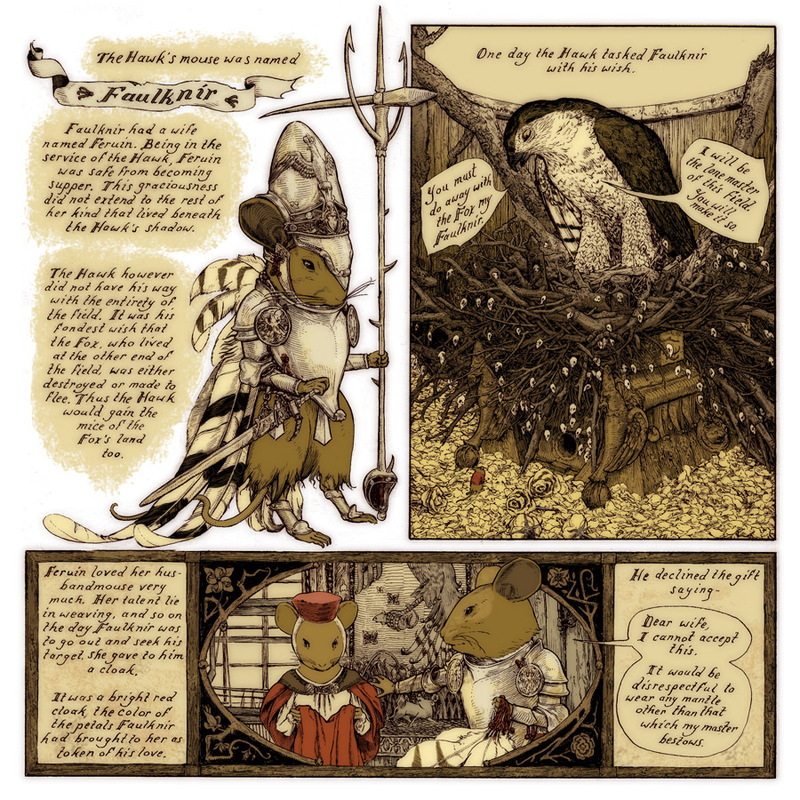 I started with this brilliant page of Jeremy's from "The Tale of the Hawk's Mouse and the Fox's Mouse" from Legends of the Guard Volume 1 (which I'm fortunate enough to own the original of). 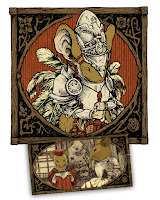 Jeremy did a fantastic job of creating a myth about the creation of the Mouse Guard that I'm jealous of to this day. 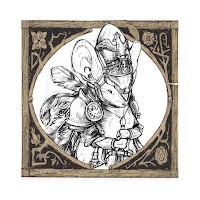 I've drawn from this story for the Mouse Guard short story "Service to Seyan" as well as last year's bookplate (and a few easter eggs in Black Axe). Here we see Jeremy's design for Faulknir, his armor, & feather cape. 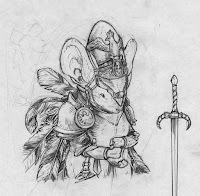 On copy paper with a mechanical pencil, I set to draw my version of Faulknir. I tried to keep as much of the detail of Jeremy's version in as possible, but executed with my proportions, line style and sensibilities. 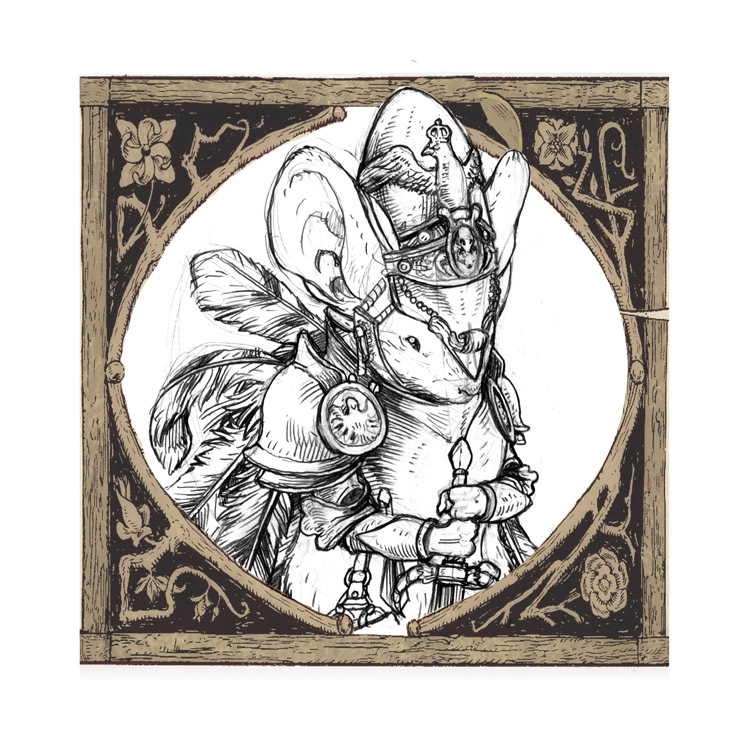 Though, it was hard not to include more lines for shading like an etching. 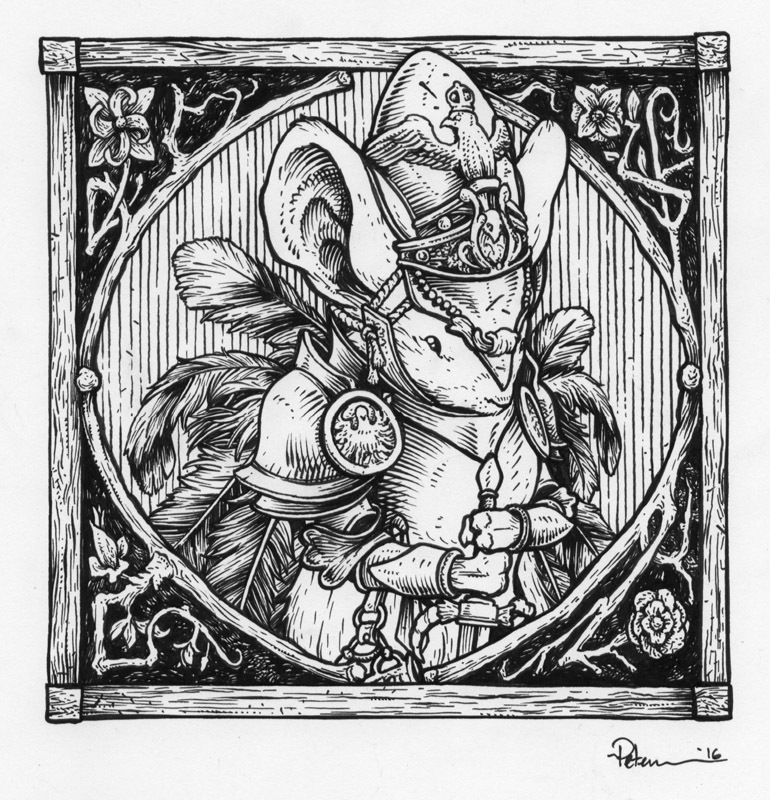 I'd considered doing this piece as an etching (my degree is in Printmaking) but time & access to a press, acid, & supplies made me opt to just ink this traditionally as an illustration. I took that drawing and composited it in Photoshop inside the borders that Jeremy drew on the bottom panel of his page. I, of course, checked with Jeremy before doing this to get his blessing. Like last year's bookplate I wanted to keep the motifs and aesthetics that Jeremy infused into those mice. I printed out and taped the above layout to the back of a sheet of Strathmore 300 series bristol. 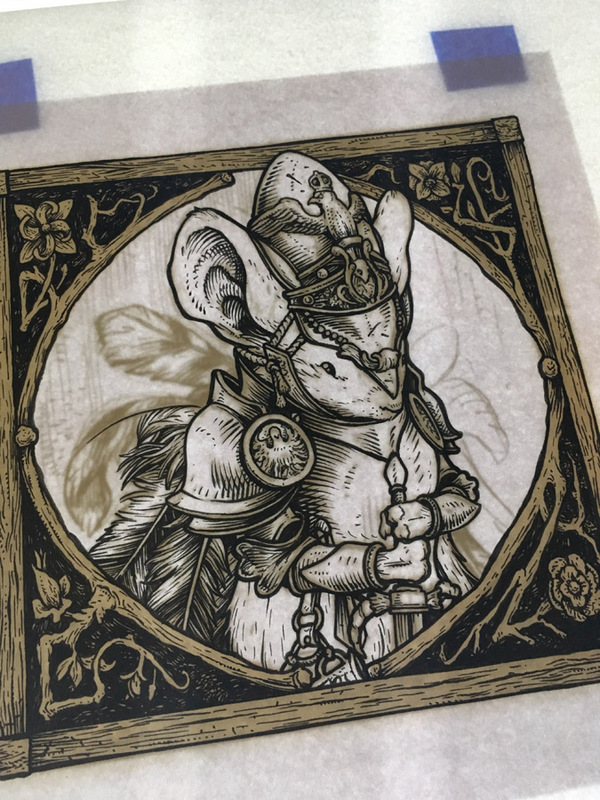 On my light pad (I like using the Huion brand of these) I could see through the surface of the bristol to use the printout as 'pencil' guides as I inked. I used Copic Multiliner (the 0.7 & 0.3 nibs) to ink this piece. 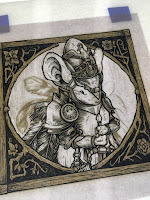 To the left you can see a phone-photo of the inks in-process on the light pad. Here are the finished inks for the piece. I added a vertical line pattern behind Faulknir to help him pop a bit. 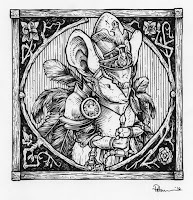 Like I did on Wind in the Willows, the key to having these lines look organic, but still evenly spaced & straight is to use a t-square and pencil them onto the back or print out a lined guide and then ink them by hand with no ruler, allowing for little hiccups and imperfections as you go. To color this piece, I pulled my first-pass palate from Jeremy's panels. 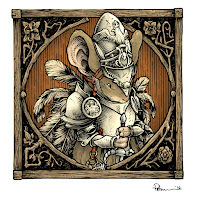 Jeremy purposely used a limited color-range when doing his Legends story, and unlike last year's bookplate of Silfano, I chose to use the same limitation of hue Jeremy did. 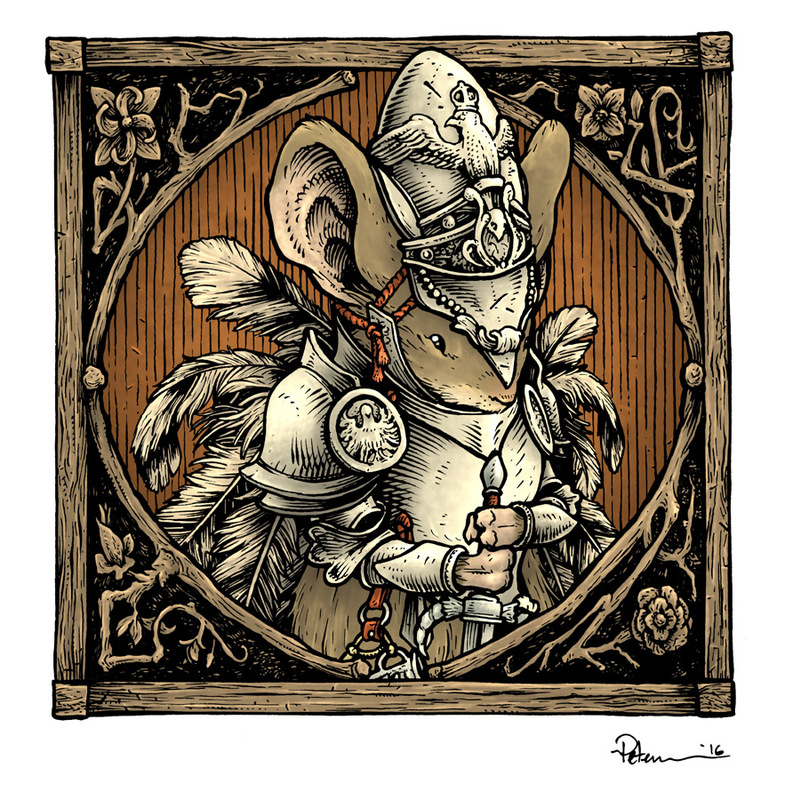 Ultimately, as I did the final rendering, I adjusted the colors a bit, so that they had some of my voice, but still payed homage to the wonderful work of Jeremy's. 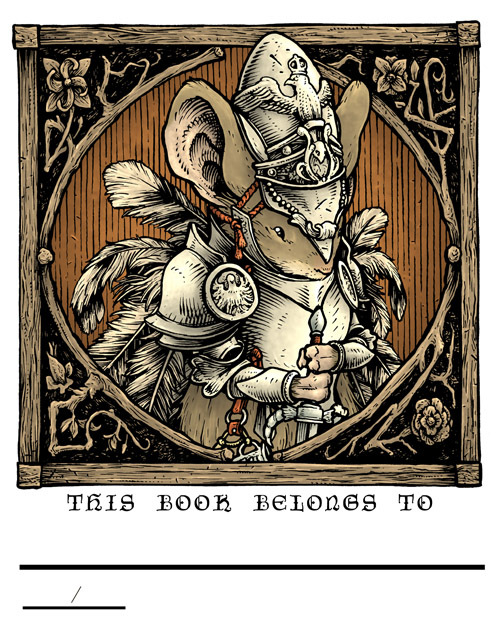 Here is the finished artwork sans-text & bookplate trappings. 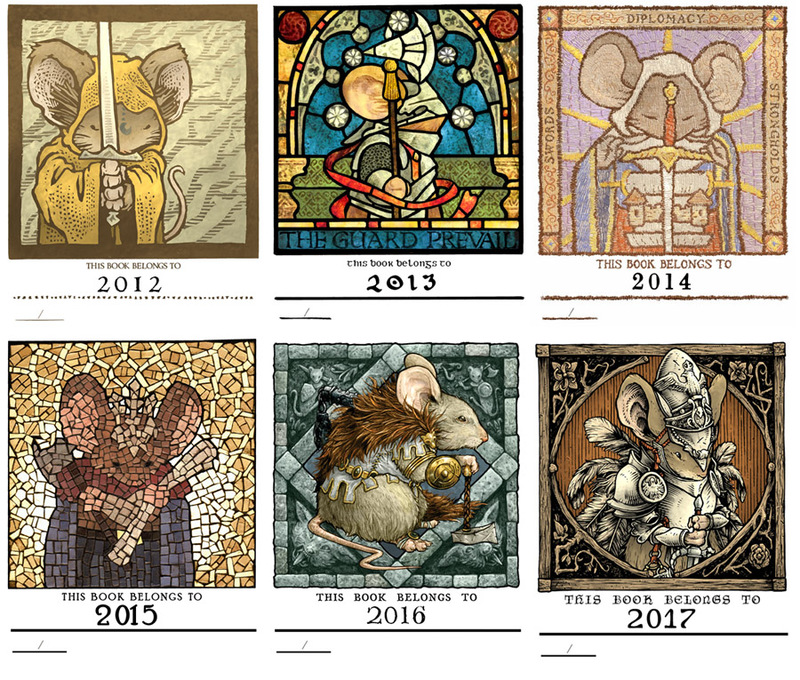 The bookplate will be available at all my 2017 convention appearances and later in march in my online store.